Historical writers plan book fair, related activities – Welcome to Wyandotte Daily! Rebecca Barber Meditz, the president of the Wyandotte County Historical Society, and her husband, Dave Meditz, will be in costume at the Historical Writers’ Book Fair from 10:30 a.m. until 4:30 p.m. Sunday, Nov. 18, at the George Meyn Community Center, Wyandotte County Park, Bonner Springs. Dave Meditz will portray Vincent J. Lane, an editor and political figure of the 1800s. The public will have an opportunity to visit with authors at a Historical Writers’ Book Fair from 10:30 a.m. until 4:30 p.m. Sunday, Nov. 18, at the George Meyn Community Center in Wyandotte County Park, Bonner Springs. The Wyandotte County Historical Society will sponsor the free event. More than 20 authors plan to attend and will be available to answer questions about local history and what it takes to be an author. Loren Taylor, a Wyandotte County lawyer and historian for the society, is in charge of arrangements. “This event is dedicated to the historical writers and their efforts to collect and preserve the people of Wyandotte County,” Taylor said. This also will be the annual meeting of the Historical Society which is celebrating its 130th anniversary. Dr. Frederick Holmes of Lenexa will speak on medical doctors and nurses during World War I at 1 p.m. Dr. Holmes and his wife, Dr. Grace Holmes, served as medical missionaries for the Lutheran Church in Malaysia and East Africa. He was the Hashinger Distinguished Professor of Medicine at the University of Kansas School of Medicine, retiring in 2000. He also has a master’s degree in British history from KU. Officers and directors for the society will be elected. Costumed re-enactors will include Dave Meditz who will portray Vincent J. Lane and Roger Miller who will portray an 1870s medicine man. Lane was an early day Wyandotte County editor and political figure. Both Meditz and Miller are past presidents of the society. Rebecca Barber Meditz, the current president of the Historical Society, also will dress in a costume typical of the 1800s. Mike Calwel, a member of the board of directors of The Friends of the Kaw, will portray Sgt. Patrick Gass. Sgt. Gass was a member of the Lewis and Clark Expedition in the early 1800s. Calwell traveled to the West Coast as part of the 200th anniversary celebration of the expedition. Stephen Zuk will present a show of early day photographs from Wyandotte County at 2:15 p.m. and again at 3:15 p.m.
A food court will serve coffee and doughnuts and luncheon items. For more information, telephone Loren Taylor at 913-321-6195 or Rebecca Barber Meditz at 913-406-2382. 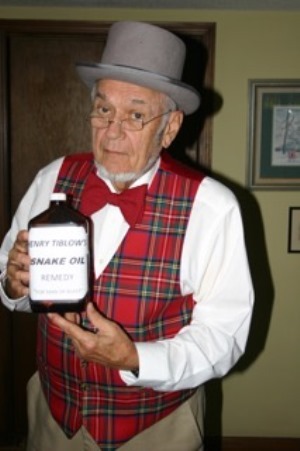 Roger Miller, a retired pharmacist, will portray an 1870s medicine man at the Historical Writers’ Book Fair from 10:30 a.m. until 4:30 p.m. Sunday, Nov. 18, at the George Meyn Community Center, Wyandotte County Park, Bonner Springs. Mike Calwell will portray Sgt. Patrick Gass who was a member of the Lewis and Clark expedition. Calwell, a member of the board of directors of the Friends of the Kaw, will be in costume at the Historical Writers’ Book Fair from 10:30 a.m. until 4:30 p.m. Sunday, Nov. 18, at the George Meyn Community Center, Wyandotte County Park, Bonner Springs.